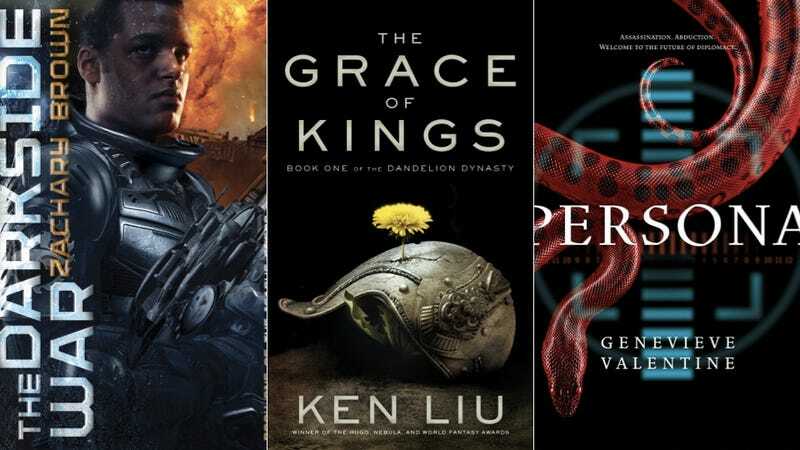 SAGA, the new science fiction and fantasy imprint from Simon & Schuster, debuts next spring with an exciting slate of books—including the first novel from Hugo, Nebula, and many other awards-winning writer Ken Liu. Here's our exclusive reveal of the covers for SAGA's first set of books. It's been nearly two decades since the Red Allies first attacked New York, and Manhattan is now a prisoner-of-war camp, ruled by Rolladin and her brutal, impulsive warlords. For Skyler Miller, Manhattan is a cage that keeps her from the world beyond the city's borders. But for Sky's younger sister, Phee, the POW camp is a dangerous playground of possibility, and the only home she'd ever want. When Sky and Phee discover their mom's hidden journal from the war's outbreak, they both realize there's more to Manhattan—and their mother—than either of them had ever imagined. And after a group of strangers arrives at the annual POW census, the girls begin to uncover the island's long-kept secrets. The strangers hail from England, a country supposedly destroyed by the Red Allies, and Rolladin's lies about Manhattan's captivity begin to unravel. Hungry for the truth, the sisters set a series of events in motion that end in the death of one of Rolladin's guards. Now they're outlaws, forced to join the strange Englishmen on an escape mission through Manhattan. Their flight takes them into subways haunted by cannibals, into the arms of a sadistic cult in the city's Meatpacking District and, through the pages of their mom's old journal, into the island's dark and shocking past. Genevieve Valentine is the author of Persona and of the critically acclaimed debut novel Mechanique: A Tale of the Circus Tresaulti, which won the Crawford Award for Best Novel, as well as a nomination for the Nebula Award and the Romantic Times Best Fantasy of the Year. Her short fiction has been nominated for a World Fantasy Award and the Shirley Jackson Award. She lives in New York City. Visit her at GenevieveValentine.com. People used to wonder if we were alone in the universe. Well, we're not. Not by a long shot. Aliens come in all shapes and sizes, and even the good guys are likely to haunt your nightmares. And oh, you'll have nightmares, even after you leave the service. If you leave the service. Devin is a reluctant conscript to an alien-run army: when the Accordance conquered Earth, they said it was to prepare against the incoming alien Conglomeration forces. But as Devin travels to the dark side of the moon for boot camp and better acquaints himself with his so-called allies, his loyalties are increasingly tested. Because the enemy of the enemy is not always a friend. Sometimes they're a far, far worse threat. Zachary Brown is pseudonym. Brown is a New York Times bestselling author as well as a Nebula and World Fantasy Award finalist. Fans of intrigue, intimate plots, and vast battles will find a new series to embrace in the Dandelion Dynasty. Ken Liu's fiction has appeared in F&SF, Asimov's, Analog, Strange Horizons, Lightspeed, and Clarkesworld, among other places. He has won a Nebula, two Hugos, a World Fantasy Award, a Science Fiction & Fantasy Translation Award, and been nominated for the Sturgeon and the Locus Awards. His wife, Lisa Tang Liu, is an artist. The Grace of Kings is set in a universe they created together. He lives near Boston with his family. These are the secrets I have kept. So starts the diary of Will Henry, orphan and assistant to a doctor with a most unusual specialty: monster hunting. In the short time he has lived with the doctor in nineteenth-century New England, Will has grown accustomed to his late-night callers and dangerous business. But when one visitor comes with the body of a young girl and the monster that was eating her, Will's world changes forever. The doctor has discovered a baby Anthropophagus—a headless monster that feeds through a mouth in its chest—and it signals a growing number of Anthropophagi. Will and the doctor must face the horror threatening to overtake and consume the world…before it is too late. While Dr. Warthrop is attempting to disprove that Homo vampiris, the vampire, could exist, his former fiancée asks him to save her husband, who has been captured by a Wendigo—a creature that starves even as it gorges itself on human flesh. Although Dr. Warthrop considers the Wendigo to be fictitious, he relents and performs the rescue—but is he right to doubt the Wendigo's existence? Can the doctor and Will Henry hunt down the ultimate predator, who, like the legendary vampire, is neither living nor dead, and whose hunger for human flesh is never satisfied? Every two hundred years or so, on the planet colony of Pern, shimmering Threads fall from space, raining death. Yet the great dragons of Pern, mounted by the stalwart dragonriders, scour the skies with fire to destroy the deadly Threads and save the planet. But it was not Threadfall that made young Menolly unhappy. It was her father who betrayed her ambition to be a harper, who thwarted her love of music, because she was a woman. Menolly had no choice but to run away. When she came upon a group of fire lizards—wild and smaller relatives of the fire-breathing dragons—she let her music swirl around them. She taught nine of them to sing. And suddenly Menolly was no longer alone—she was Mistress of Music, and Ward of the dazzling fire dragons. Anne Inez McCaffrey (April 1, 1926–November 21, 2011) was an American-born Irish writer, best known for the Dragonriders of Pern science fiction series. Early in McCaffrey's forty-six-year career as a writer, she became the first woman to win a Hugo Award for fiction and the first to win a Nebula Award. Her 1978 novel The White Dragon became one of the first science fiction books to appear on the New York Times bestseller list. In 1999 she was the recipient of the Margaret A. Edwards Award, honoring her lifetime contribution to writing for teens. In 2005 the Science Fiction and Fantasy Writers of America named McCaffrey its twenty-second Grand Master, an annual award to living writers of fantasy and science fiction. She was inducted into the Science Fiction Hall of Fame in 2006. Pursuing her dream to be a Harper of Pern, Menolly studies under the Masterharper and quickly learns that more is required than a facility with music and a clever way with words. The Masterharper gives her a difficult time simply because she is a young woman, and she manages to alienate more of her fellow harpers than she makes friends. Menolly must rise up and prove that a woman is just as capable as any of her male fellow students—and if she can, she will shape the future of Pern. As Menolly navigates her way as the first journeywoman Harper in the history of Pern, fellow student Piemur is asked to leave Harper Hall. Secretly, Piemur is drafted by Masterharper Robinton to become a dragonrider—and he will soon embark on a dangerous mission to the Southern Hold.